“What the Power of the Slowing taught me is what the Source of All constantly yearns for: that each one of us will know without doubt that we are loved, and that we are intimately, irrevocably part of the endless creation of love, and that we will join, with full freedom and consciousness, the joyous creativity that is Nature, that is Wildness, that is Wilderness, that is Everything.” The Wisdom of Wilderness, by Gerald G. May MD, p. 190. A late February storm blew through the Owens Valley last night. As I drive on a rutted country road west of Highway 395 in Lone Pine, hazy morning clouds open up to radiant sunlight. The Sierra behind me to the west and the Inyo Mountains ahead of me are covered with heavy snow almost to the valley floor. I drive past a pioneer cemetery filled with sagebrush and willow. The narrow road abruptly makes a sharp right turn and I slow down in time to get a good look at an old horse trailer parked at a pasture entrance. A cowboy wears a beaten old Stetson, long braided hair flows down to the middle of his back. Can’t see his face. 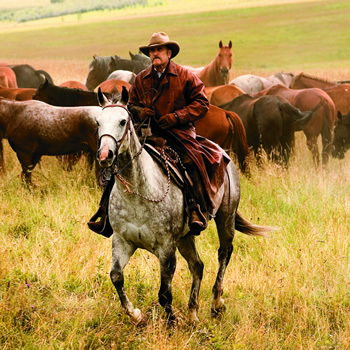 He is leading a saddled, brown quarter horse out of the trailer. As I pass him, I can read a painted sign on the side: “All Indian Rodeo, Fallon, Nevada. Champion 1998”. I remembered that I was driving through the Lone Pine Paiute Indian Reservation and here was an Indian cowboy going to work. The street is lined with huge, old cottonwoods. This time of year the branches are barren, the bark brittle and they all look dead. In a month a green patina of buds will cover the tree as a sign that spring is coming. I am searching for a way to get down to the Owens River, for the past 80 years a sad sump of debris and dying trees. Recently, the LA Department of Water and Power released aqueduct water into the river, reviving plant, bird and animal life. I have not had a lot of luck getting close to this winding, meandering waterway. I have a topographic map on my lap that shows a trail up ahead going off this road. I find the break in the barbed wire fence, park my Honda Pilot in the grass, button up the heavy Carhartt jacket and cross over to the other side of the road. I walk over a broad cattle guard, ribboned with steel bars to keep range cattle from wandering onto the highway. I see a winding line of cottonwoods in the distance, a hint that the Owens River must be there. The cow path drops lower into dense sand. A thousand years ago, the river was flowing right where I walk. I follow the cow path toward a thicket of willow and birch trees. To my left I see a Black Angus cow standing beside a little black clump of something steaming. A new baby calf born in the last couple of hours. 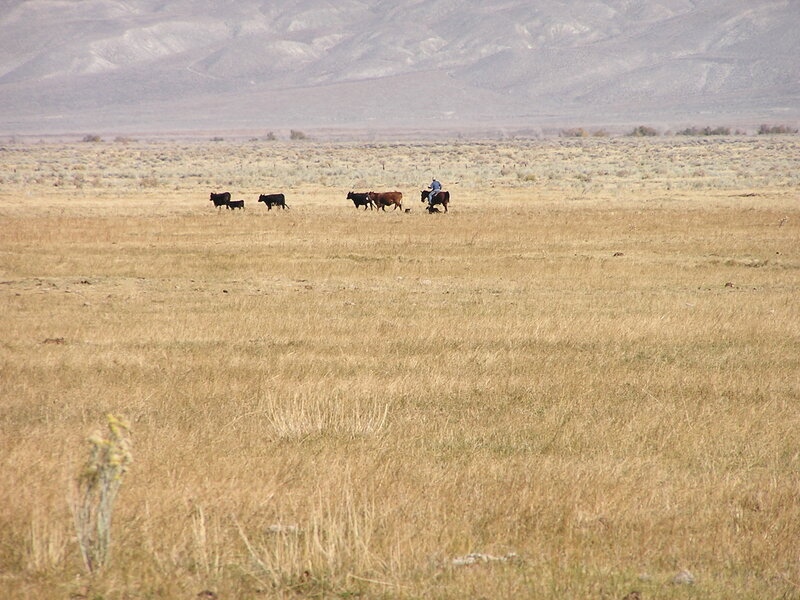 This is the time of year where newborn calves dot the rangeland of the Owens Valley. The mother bawls a loud moo at me. I walk quickly away. I don’t want to scare her. But she keeps up the loud mooing. I walk toward the river, a rocky hill to my right. I hear another moo coming from over there. Another cow is coming towards me, trotting quickly, with her baby running beside her. I see another cow behind her. Within minutes, I see twenty, fifty, a hundred more cows moving quickly toward me. A stampede in slow motion. I step back toward higher ground. This is weird. Usually when I hike through the rangeland of the valley and run into a mother with her calf, they quickly run off. However, all of these cows are moving closer and closer toward me. They are all mooing loudly, as if demanding some action. At that very moment, the Indian cowboy appeared to my left, riding out of the sagebrush. He waved and smiled and road down into the crowd of cows, looking intently at the baby calves. Then it hit me: dressed in my heavy jacket and high top Stetson hat, they thought that I was the rancher, hopefully bringing hay to supplement their grazing. They wanted their breakfast! 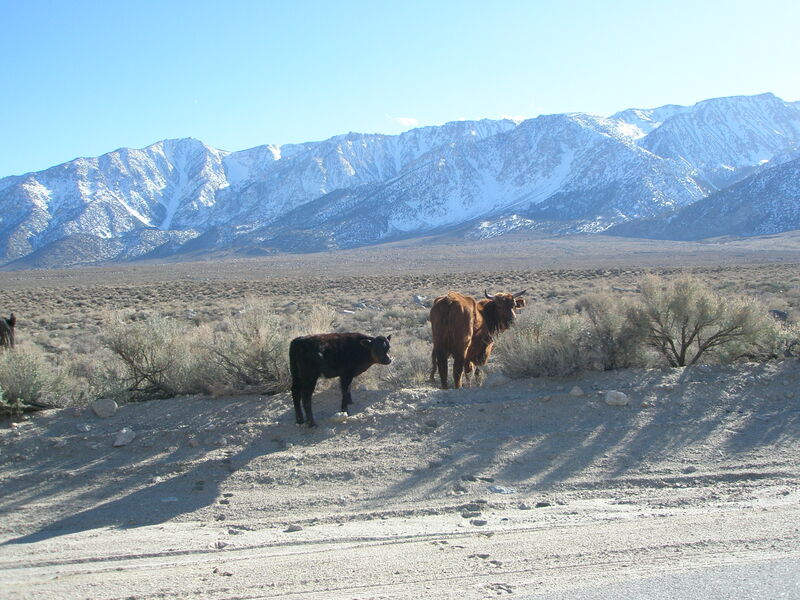 As you and I take our contemplative hikes through the dramatic desert landscape of the Owens Valley, we will see more cattle than humans. I heard somewhere that there can be up to 25,000 head of cattle in the valley at one time. The cattle were first brought here in the 1860s to provide food for the bustling mining camps of Bodie and Cerro Gordo. 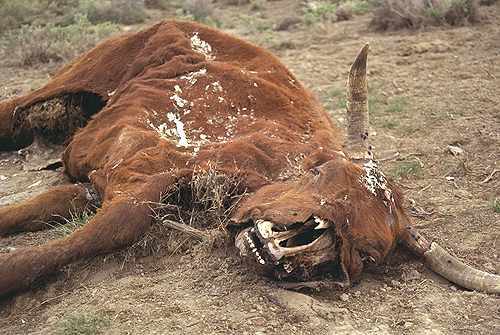 The cows ate the forage of the deer and elk, displacing native food sources for the Paiute. As Euro Americans took over possession of this land, some Paiute adapted by becoming renowned cowboys. Ranching is still a hard life. Late winter/early spring is when the baby calves are born and you will sometimes see cowboys riding the range to check on these precious bundles of new life. “Ever since the first of the year our main activity has been taking care of the first calf heifers. That is our term for a young cow that has never had a calf. They require extra care, feed and observation. These are first calf heifers. We keep them in a pasture of about 200 acres. When they start calving approximately January 15th, we start riding through them horseback about three to four times a day. They are very inexperienced and do some dumb things. Some examples of heifer behavior are; giving birth just fine and then walking away – so we must find the heifer and take her back and try to bond her to the calf, some try to steal other heifer’s calves, some can’t give birth and we must assist the birth, occasionally we have caesarian sections, sometimes the calves are weak and we must bottle feed them until the gain strength, some heifers won’t accept their calves and we will graft them on another heifer that is more maternal. When the calves are born, they get an ear tag with their mother’s number on it and source identification number that can be traced back to our ranch. After a long contemplative hike on the open rangeland, being sensitive to my cattle companions, I nestled in to a warm bed at night in my room at the Dow Villa Motel in Lone Pine. The cold wind howls. Signage on Highway 395 sways precariously. Lights flicker. I think about those mother cows and their babies in the darkness. There are mountain lions and coyote packs out there. How do the cattle survive? There must be a heightened, attentive alertness of the senses to everything happening in the present moment. My mind shifts, as I stare into the dark ceiling of my room inviting the Lord’s presence. Contemplation like my praying in this present moment must be some kind of awareness that is wide-open and completely present to what is happening right now. But most of the time I am not like this. My culture and schooling have trained my brain to focus on specific tasks (like typing these words). I have to filter out background noises and focus. When we have long period of focusing on a task at work or writing, we become fatigued. You know the feeling. Even when we are not working on some specific task, our brains have been trained to tune out background stimuli. I am thinking of those baby calves in the open range of the Owens Valley. They are natural contemplatives. Mother cows teach their young ones not to focus on any one thing. They must keep their senses open and alert. The mother cow teaches her baby to “watch out for themselves, to remain open, and sensitive to sights, sounds and smells coming from any direction at any time.” (May. p. 64). Like contemplative cows, our disabled son Erik has been my tutor in the contemplation of the Present Moment. I am so busy with my do list, focusing hard on this and that task. Doing one thing at a time, I miss everything else. I take Erik for a walk after dinner on a summer evening. He is mentally a three year old in a 29-year-old body. I hold his hand as we walk, as his gait is unsteady. He is taking everything in. We walk. I say, “The leaves are rustling in the wind….the bird is singing…..the yellow butterfly is flying….the sun is warm on our face….the puffy clouds are floating in the blue sky.” All in the present moment. That is where Erik lives: little memory of the recent past, no fear or anxiety about the future. In our circle of love and care, Erik is fully present in this moment. “Like domesticated animals, we are completely unprepared for the wild—-the wild outdoors, the wild in our cities, the wild in our own psyches. In any of these places, we panic when we’re lost and afraid. We frantically concentrate our attention here and there, following nonexistent tracks, unaware of a thousand clues form sky and light and smell and inner Wisdom that could tell us where to go and what to do. Feeling so divorced from the nature within and around us, we make wilderness an adversary that we must tame rather than join, master rather than learn from. Where we find it, we feel we must force Nature into the tunnel of our own concentrated vision.” (May, p. 65). There is a gift in this spirit soaked land. I have experienced it. You will arrive for your three or four day visit of contemplative walks. The first day or so you are concentrating on tasks unfinished or focusing too much of this or that details. After a full day of walking through the landscape, the land and the Presence of the Holy will make their claim on you. Mental and sensory filters will open up. Life will slow down and Grace will guide you by the hand into the Present and you will be at home again. This entry was posted in Blog and tagged Black Angus cattle, cattle ranching, contemplative, Gerald G. May MD, Owens River, Owens Valley, Paiute, present moment, Zen. Bookmark the permalink. praying and staying in the moment!